Explanation: Neutrinos are subatomic particles generated by the nuclear reactions which power stars like our Sun. Flying outward from the Sun's core, they easily pass through the Sun (and almost anything else!) unimpeded and should be detectable by earth-based neutrino "telescopes". Still, to the long-standing consternation of astrophysicists, the observed flux of solar neutrinos is less than expected. In a new twist to this solar neutrino saga, an analysis of data from the GALLEX / GNO neutrino detector finds a solar neutrino flux that varies over about 27 days ... approximately matching the Sun's rotation period. 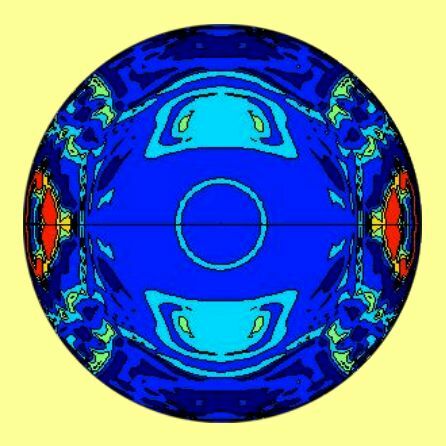 In fact, since different parts of the Sun rotate at different rates, the neutrino flux variations match most exactly the rotation rates of the areas shown in red on this colorful cross-sectional map of the solar interior rotation. So how could solar rotation affect the neutrino flux? Some theoretical models say that neutrinos can change quantum properties when they interact with tangled solar magnetic fields and become particles that the neutrino experiments were not designed to detect. Then, as the Sun rotates, the neutrinos sometimes come to us unaffected and sometimes come through magnetic fields, diminishing the flux that can be measured.